This is a fairly upright form and Darwinia lejostyla is grown for the colourful red flowers that appear in good numbers from autumn through to summer. Like all of the genus this is a plant that will grow well in full sun and requires a very well drained soil. Good air circulation is important so as to keep humidity at bay. Humidity will cause fungal diseases and the demise of the plant. Found naturally in restricted areas of the Stirling Ranges. 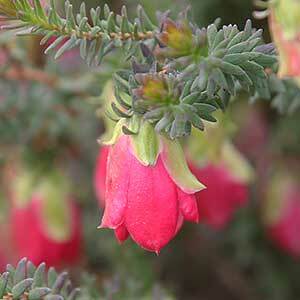 A cultivar named Darwinia leiostyla (Coolamon Pink) has been introduced into cultivation and is worth looking for. It features larger flowers and again flowers over a very long period. Best planted in full sun to a little shade in a well drained soil. A little extra water through the first summer may be required. A yearly application of a native plant fertiliser will assist with growth. Flowering time – Autumn through to summer. Height – To around 1.5 metre, often less than half this height.